Infiniti Review: The new Infiniti FX looks and feels different from other luxury SUVs, opting for a more polarizing body style and a high-tech cabin. Four video cameras mounted on the Infiniti FX give a bird's eye view of the car when parking. It's a useful feature that takes the concept of back-up video cameras a step further. They may come packed with features, but nearly all luxury crossover SUVs lack one thing: personality. Consider the Lexus RX. It's the best-selling luxury SUV in the world, filled with all the gadgets and doo-dads you could ever wish for, but it also has the personality of a saltine cracker. 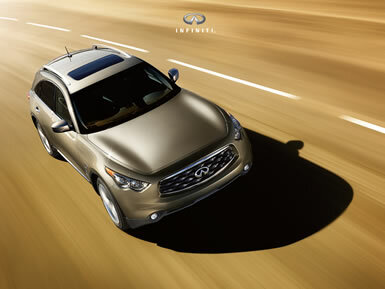 Infiniti tries to remedy this problem with its own luxury crossover called the FX. It has all the electronic magic that its competitors do, and even some they don't, but has a distinctive look and feel that truly make it stand out from the crowd. It's like break-dancing while the rest of the market does a waltz. For starters, its body looks like a Martian feline. There are no bland lines or predictable curves, instead opting for a polarizing shape with a long hood and alien bulges all over the body. I love the look, but not everyone will. It also feels far different from most luxury SUVs, even those designed to be sporty. It doesn't drive with the flair of a big sports sedan like the BMX X5, nor does it float as serenely as the Lexus. Instead, the FX drives like a little coupe on stilts. It's an odd feeling, one that takes time to adjust to, yet it feels absolutely perfect for this particular vehicle. With rear or all-wheel drive and a surprisingly firm suspension, the FX can even be fun in the bends. It's a wonderful blend of sumptuous and zippy. Inside, the FX is a showcase of the latest automotive technology. Of course it's got the basics like a navigation system and available DVD player, those things are becoming pass�. but it also comes with some whiz-bang features you wouldn't expect, like radar-equipped cruise control that keeps you from hitting the car in front of you, and a beeper that warns you when you start to stray from your lane. Other fancy features include heated and cooled front seats, an automatic climate control system, an "intelligent key" that lets you start the engine while it's still in your pocket, a hard drive to store your digital music files, and a Bluetooth connection for your cell phone. But my favorite feature of all is something called the "around view monitor" that helps when parking. Unlike a regular back-up video camera, which only shows what's behind the car, this Infiniti has four different video cameras that show what's on all sides. It's basically a bird's eye view of your vehicle, amazing stuff. On the downside, all this technology makes the dash look like the Chernobyl control room. There are buttons everywhere, four on the instrument pod, 10 on the steering wheel, plus two paddles to shift gears, nine by your left knee, and a whopping 60 on the upper console. Sixty! Not only that, but some of the buttons are labeled with such esoteric acronyms that it takes a Yale-educated physicist to figure out what they mean, like FCW/LDW, DCH, IBA and VDC. What was tested? The 2009 Infiniti FX35 RWD with a base price of $40,950. Options on the test car: Premium package $2,350, navigation package $2,850, technology package $2,900. Total MSRP price as tested including the $815 destination charge: $49,865. Why avoid it? The sheer number of buttons in the cabin can be overwhelming. Why buy it? It has a distinctive style, nimble driving feel and more technology than most other luxury SUVs. Bottom Line: Still, I can overlook the Infiniti's button overkill on the FX because it's got so many bright spots. It drives beautifully, looks great and comes with eye-popping technology. And, best of all, it actually has some personality.